Audi has unveiled the new second-generation Q7, bringing a dose of modesty to its hulking full-fat SUV. The 2015 Audi Q7 has less of everything: less visual heft, with a dose of large estate styling according to some at CAR, less weight and lower emissions. There are numerous tech firsts for Audi, such as its first Quattro diesel plug-in hybrid - and what you see here will heavily influence the forthcoming Bentley SUV, next VW Touareg and - presumably - the Lambo crossover too. 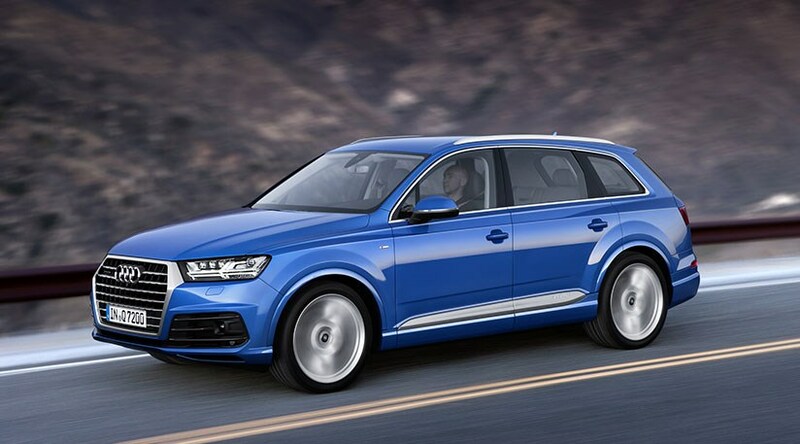 You’ll see the new Q7 first, though; it lands in UK dealerships in summer 2015. See the new Q7 at the Detroit motor show in January 2015; UK order books open soon after in the spring, with prices expected to rise slightly from today’s £47,000. The big news is the adoption of more lightweight materials in its construction; this is all relative, remember. The lightest Q7 3.0 TDI now weighs 1995kg - according to Audi, the lightest in class. That might still make it a strapping big car, but you’ve got to applaud the loss of 325kg from the Q7’s kerbweight. Result? The new SUV is claimed to be up to 26% more efficient than before. Needless to say, it should handle less like a barge, too. It’s not all clever aluminium materials and science; the Q7 is marginally smaller than before, stretching to 5050mm long, 1970mm wide and 1740mm tall. That’s a degree shorter (-37mm) and narrower (-15mm) than the Q7 Mk1. Despite this, Audi claims the 2015 Q7 has a longer and roomier cabin than before. A new Q7 e-tron Quattro will mate Audi’s V6 diesel with its electric powertrain and four-wheel drive. No petrol engines are likely to be offered in the UK, although they could come if a diesel backlash is whipped up in Europe. This is not a pure aluminium car, like the alloy-intensive A8 or R8. The Q7 in many ways points to the future of Audi tech, using a multi-material mix. A full 41% of the body structure is made from aluminium, trimming kilos left, right and centre. Pure aluminium component include the doors, alone saving 24kg, the front wings, bonnet and tailgate. And if you’re thinking the Q7 looks less bulky and US-centric than before, you’re right. As well as being marginally smaller, it’s claimed to be sleeker too. The drag coefficient tumbles to 0.32, proof that Audi has moved away from the brick school of aerodynamics. The Audi Q7 remains a seven-seater, with three rows of seats optional. Note, however, that the third row of pop-up seats are now called ‘Group 3 child seats,’ despite having 24mm extra headroom than before and 20mm more shoulder space. They are electrically operated, rising from the boot floor at the flick of a switch. With all seven seats in action, there’s 295 litres of boot space; as a five-seater the boot grows to a generous 890 litres. This is Audi’s latest longitudinal family architecture, so the new crossover is dripping with gadgets. You’ll find the Virtual Cockpit instruments pioneered on the TT, with a 12in configurable display where dials would normally sit. And this one is said to react incredibly quickly, with a refresh rate of 60 frames per second and a resolution of 1440 by 540 pixels. Sounds Retina pin-sharp to us. Audi is also making great claims about the natural speech control, which is said to interpret voice commands with great accuracy. ‘Where can I get diesel?’ will apparently be met with instructions to the nearest petrol station, rather than a newsletter about Diesel jeans. Onboard wi-fi, inbuilt tablets for rear-seat passengers and more goodies lie onboard.